EXTRA! EXTRA! 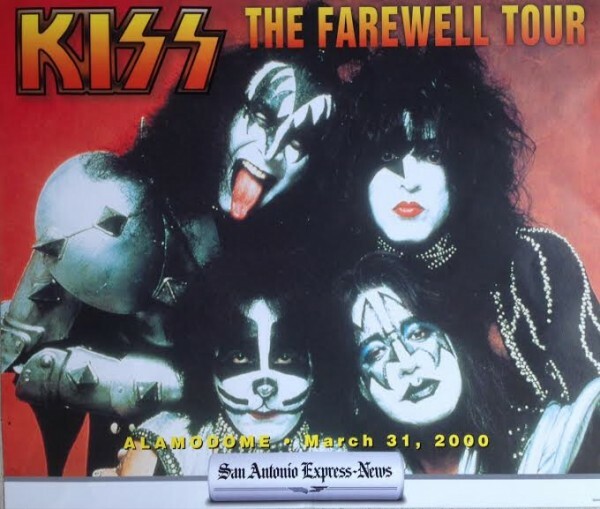 : This special edition San Antonio Express-News rack card was posted around the Alamodome on Friday March 31, 2000 announcing my Gene Simmons interview was on sale as a souvenir inside the concert arena. 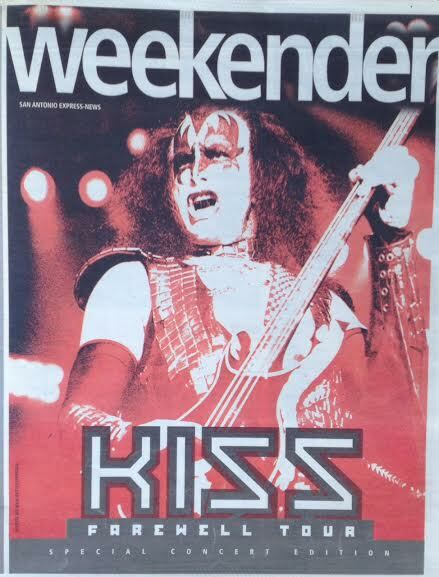 ROCK-N-ROLL WEEKEND: The cover of the special edition containing my interview with Gene. In March of 2000, I had one foot out the door when the phone rang. As part of the ongoing KISS farewell tour, I requested an interview with Gene Simmons on behalf of the San Antonio Express-News, but was told my childhood hero wasn’t scheduling press. Instead, I was told, he would carry my phone number with him and (maybe) call if and when the mood struck. Naturally, I jumped every time the damn phone rang. As my landline reached its third or fourth ring, I slammed the door behind me and ran back inside to answer. Hello? 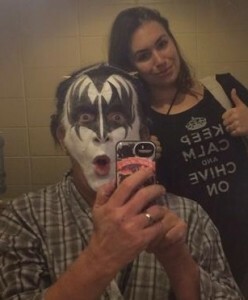 “Hi, it’s Gene Simmons calling for Dave.” Gene! “Is this a good time?” Never better. Thanks for calling. And so goes my first of five interviews with KISS, the band that turned my world upside down. 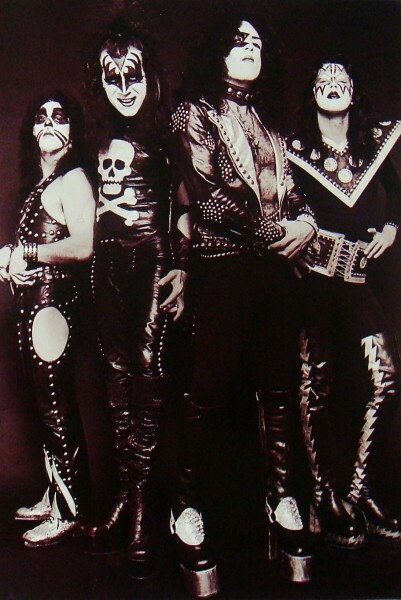 DRESSED TO KILL: Peter Criss, Gene Simmons, Paul Stanley and Ace Frehley circa 1974. Since joining forces in the early ’70s, the four painted faces of Kiss have become more widely recognized than the faces of Mount Rushmore. Boasting album sales of more than 80 million and a succession of gold and platinum awards second only to the Beatles, Kiss is as globally recognized as McDonald’s, Nike and Budweiser. So why pucker up and bid farewell at the Alamodome tonight? GOT BLOOD? 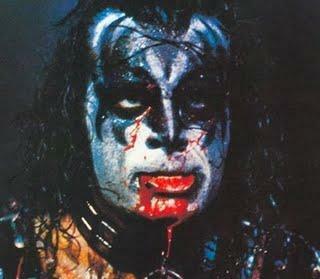 : Gene as he appeared on the cover of 1977’s “KISS Alive II” album. A childhood hero to millions, Simmons is the eternal king of the rock-star hierarchy. About the time Marilyn Manson quit spitting up on his mommy, Simmons became universally notorious as a leering, oversexed Antichrist who spit blood and fire between lashes of his world-famous tongue. Kiss’ party began humbly enough in New York under the moniker Wicked Lester. By 1973, bassist/vocalist Simmons and guitarist/vocalist Paul Stanley had recruited lead guitarist Paul “Ace” Frehley and drummer Peter Criss. Performing in makeup and androgynous costumes, Kiss was critically panned and publicly laughed at, but starry-eyed enough to keep chasing the dream. 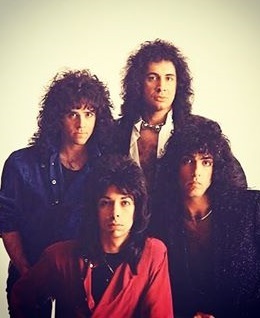 UNMASKED: The 1983 “Lick It Up” lineup featuring Eric Carr, left, and Vinnie Vincent, lower center. Kiss managed to do big business in the ’80s, but the mystique and hard-core fans were gone – until a clean and sober Frehley and Criss agreed to a full-blown, dust-off-the-costumes, put-on-the-makeup reunion tour that became the highest-grossing tour of 1996-97. Considering the band’s immeasurable riches, you’d think a makeup artist would be on staff. 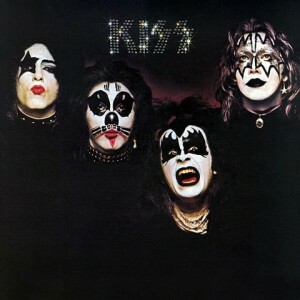 FIRST KISS: The 1974 debut album. 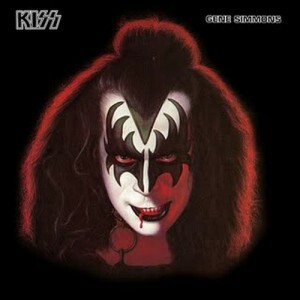 Kiss has its share of latter-day stinkers, but the classics are mandatory. “Alive!” (1975): The one that burst the dam, saved Casablanca Records from bankruptcy and made the shouted “You wanted the best …” intro as immortal as “Freebird.” A life-altering album for future rock stars Kirk Hammett, Sebastian Bach, Dimebag Darrell and others too numerous to mention, this double live package of eye and ear candy is widely regarded as one of the greatest live albums of all time. FANTASTIC FOUR: At the peak of their powers in 1976. “Love Gun” (1977): Another amazing Ken Kelly painting finds our mighty heroes surrounded by a bevy of Vampira-like babes. Inside, Kiss cranks out the classic title track, “Christine Sixteen,” and “Shock Me.” The sleepers, “Got Love for Sale,” “Plaster Caster” and “I Stole Your Love,” are full-on headbangers. “Alive II” (1977): The second eye-popping, double-live package is a rock-solid collection of revved-up classics that found the marketing machine going full-tilt with inserts that included a color photo booklet and temporary tattoos. The gatefold sleeve features Kiss in all its blazing, on-stage glory. “Dynasty” (1979): A left turn for Kiss as it made concessions to the disco era. Still a rocker at heart, this one contained the hit “I Was Made for Lovin’ You” along with “Charisma,” “Sure Know Something” and “Hard Times.” Cover photo and inserted poster are Kiss classics. “Creatures of the Night” (1982): The last album and tour with makeup (it stopped at the HemisFair Arena with the Plasmatics replacing Riot as openers … my first concert! ), “Creatures” marked a return to the band’s more sinister looking, harder-rocking roots. 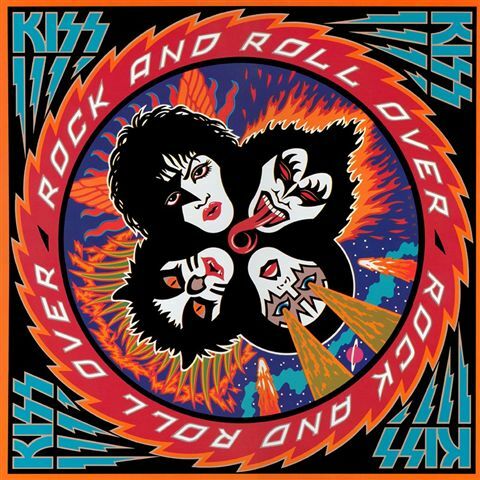 The title track, “I Love it Loud,” “Killer,” “War Machine” and “I Still Love You” brought long-time turncoats back to the Kiss Army. Kiss die-hards pride themselves on knowing the most obscure facts. See how you fare (answers follow questions). Peter Criss is best known for singing the ballad “Beth,” but he was a prolific lead vocalist throughout his tenure with Kiss. Of the 10 songs he’s sung, name his two lead vocals on the “Hotter than Hell” album. Whose kids are speaking on walkie-talkies at the beginning of “God of Thunder”? Kiss current road manager is Tommy Thayer. What ’80s hair band did he play guitar in? What Motor City rock star contributed backup vocals to “Radioactive” and “Living in Sin” on Gene’s 1978 solo album? Two of the guest musicians on Ace’s solo album are now part of Paul Schaffer’s CBS orchestra (“Late Show” with David Letterman). Name them and their instruments. Who originally wrote “2,000 Man” from Kiss’ “Dynasty”? 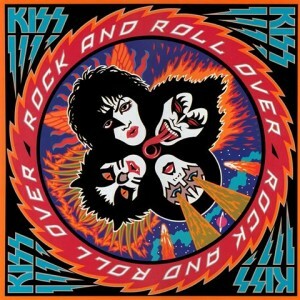 One Kiss album was released with two different covers featuring two different guitarists, neither of whom contributed to the record. What was the album and who was the actual guitarist? Who is the unlikely pop star that helped Gene write “War Machine”? What superstar rock band is Gene credited with discovering? The answers for question #1 are wrong: Petter sings lead vocal on “Mainline” and “Strange Ways”. Paul sings on “Comin’ Home”. Your site is awesome, always a good reading. Whoa! Thanks for the correction, Astilla Nobody caught that in 20 years. Thanks also for reading. Nice to know you enjoy all the way from Argentina. Cheers!